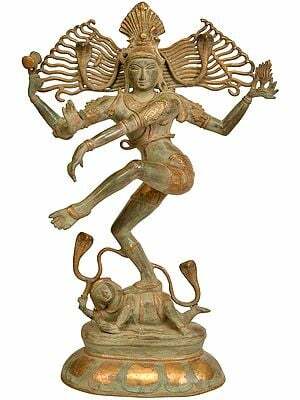 This striking Shiva sculpture is indeed the very picture of asceticism. This portrayal depicts Him walking across the Himalayas, a section of the jagged folded rocks beneath His kharam-clad feet. 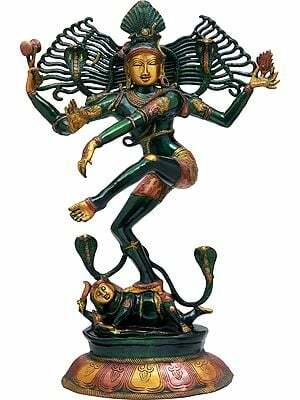 The same are in a dynamic stance, the veins and the musculature of the limbs so lifelike it feels like the lord Himself has emerged within one's view. A leopard skin functions as His loincloth, one that He had encountered and killed in the mountains (its lifeless head dangles against His thigh). Against it hangs a roughly fashioned bugle, which together with the damru is used by the deity to summon the Shivagana, His band of devotees. 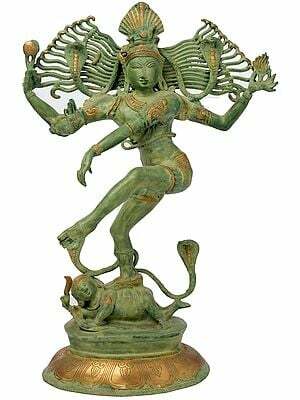 His austere shringar comprises of ample rudrakshas that clasp His wrists and arms and cascade against His torso, together with the janeu tucked loosely into the loincloth. 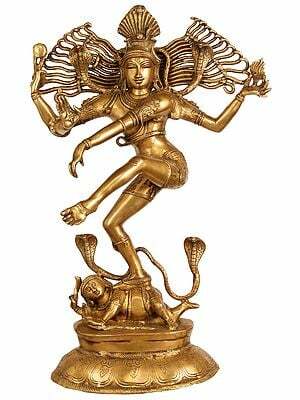 A stateliness characterises this composition of Shiva. His gaze is powerful, directed straight ahead, which is matched by the dignified stance of the wide-hooded cobra that sits on His shoulder. From within the layers of His voluminous tresses that reach well below the shoulders emerge a couple of gigantic kundalas that dangle from His large lobes. The skill that has gone into sculpting this part of the statue is considerable. Each strand of the lord's hair has been defined. A sliver of the moon is balanced at the hairline, behind which towers His signature jatamukuta that is seemingly held in place by another snake. 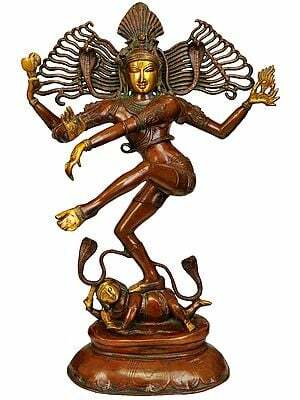 Amidst His tresses resides Ganga, who is said to have passed through there prior to descending onto the North Indian plains. A hand raised in blessing, on the open palm of which is tattooed an image of the sacred syllable, and the kamandalu He holds in the other complete the picture.